I mean, of course Justice League Dark gives us Batman. You simply can’t get away with releasing a DC team-based piece of media without Batman in it, right? I say “first” look, of course, because this isn’t really the first time we’ve had a glimpse of the animated Justice League Dark—a sneak preview of the film appeared alongside the release of The Killing Joke. But it should come as no surprise that the first official still from the movie, released today, ditches most of the actual JLD team but instead shows us Batman. 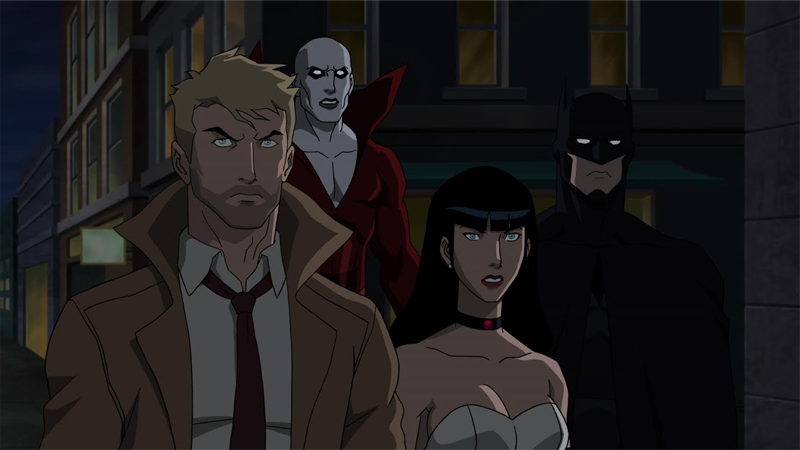 We do get to see Constantine (who will indeed be voiced by Constantine TV show star Matt Ryan), Zatanna, and Deadman, but we already knew from the preview that they’ll be joined in the film by Swamp Thing, Black Orchid, and Etrigan. And Batman! Yes, while several members of the normal Justice League (the Justice League Milk to the Justice League Dark, if you will) are in the movie, Batman will play an extended role, essentially acting as the audience’s surrogate for the supernatural world the JLD specializes in. Because could you imagine the total shock of a DC movie without Batman!? Heaven forbid the Dark Knight not start cropping up everywhere like an uninvited guest.